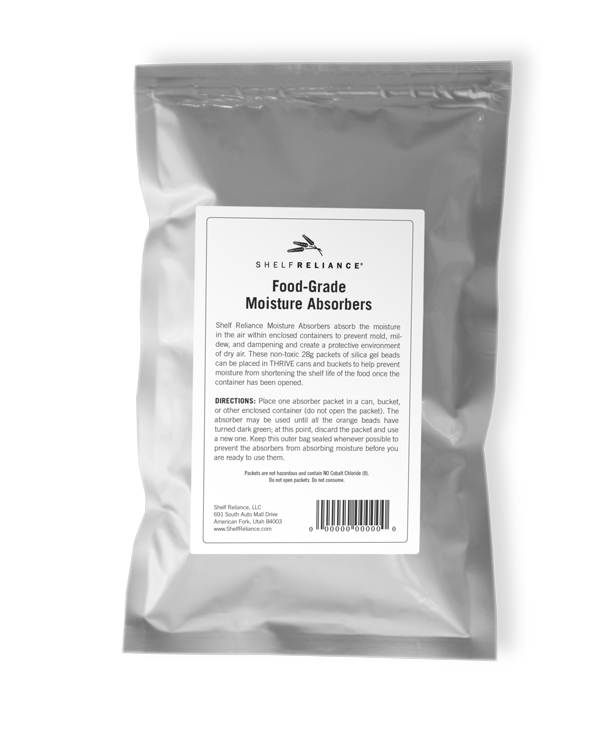 10 Moisture Absorbers are included in each pouch. Shelf Reliance Moisture Absorbers absorb the moisture in the air within enclosed containers to prevent mold, mildew, and dampening and create a protective environment of dry air. These non-toxic packets of silica gel beads can be placed in THRIVE cans and buckets to help prevent moisture from shortening the shelf life of the food once the container has been opened. Each Moisture Absorber packet is 28g, which is large enough to be used in a THRIVE bucket. Packets may be used and reused until all the orange beads turn dark green, at which point the packet will not continue to absorb moisture. 10 Moisture Absorbers are included in each pouch. Directions: Place one absorber packet in a can, bucket, or other enclosed container (do not open the packet). The absorber may be used until all the orange beads have turned dark green; at this point, discard the packet and use a new one. Keep the bag containing the packets sealed whenever possible to prevent the absorbers from absorbing moisture before you are ready to use them. Specifications: Indicating Silica Gel beads packaged in clear perforated plastic packets. Gel is not hazardous and contains NO Cobalt Chloride (II). Do not open packets. Do not consume.